Punto Shawl is an asymmetric, crescent shaped which is easy to drape and interesting to knit. 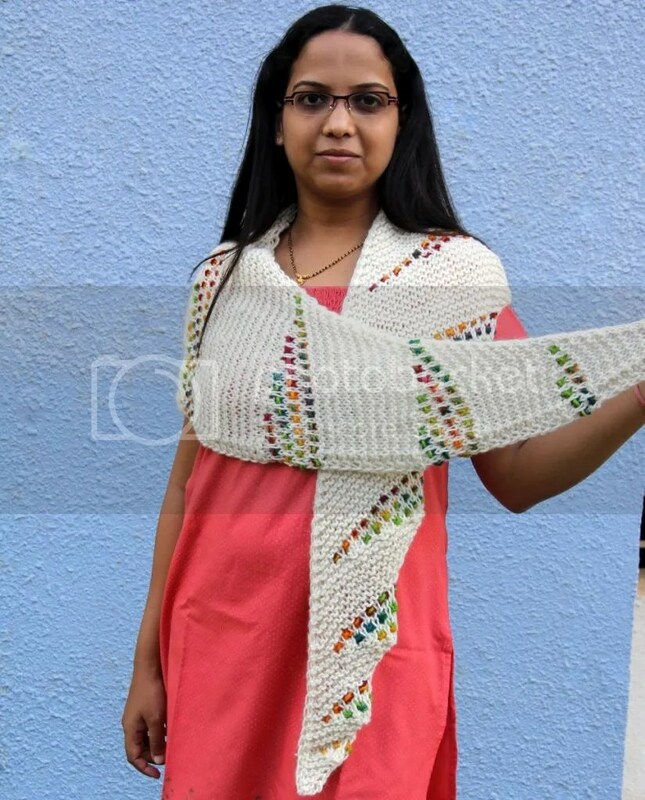 The shawl features plain garter rows interspersed with colorwork wedges with pointy edges half the way and curved edges on the other half. The shawl is worked sideways with wedges and the crescent shape achieved using short rows. Punto Shawl uses the variegated yarns to its benefit by breaking up the colors using slipped stitches. Use the same CC yarn as shown in the sample or be adventurous and use different yarns for each wedge. Instead of using variegated yarn, you can use different solid yarns for each wedge. Punto Shawl makes a great set with Punto Cowl and Punto Hat. You can buy the shawl pattern alone or grab all the three patterns in one ebook. You can get 30% off either the Punto Shawl pattern or on the Punto ebook using coupon code ‘PUNTO!‘. Hurry, sale will end May 11, midnight, India time. Ravelry Pattern: Punto Shawl by Anjali M.
Lovely pops of color against a neutral background! This one is so drapey! !